A minimalist and distraction free markdown writer and editor. 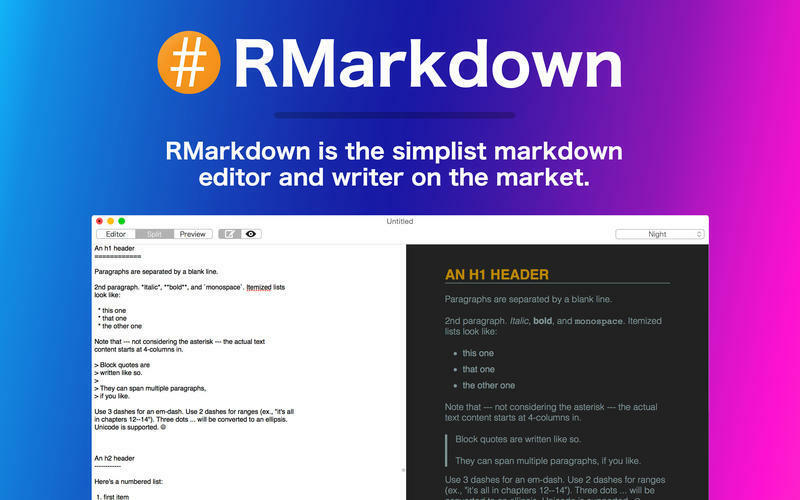 Is there a better alternative to RMarkdown? 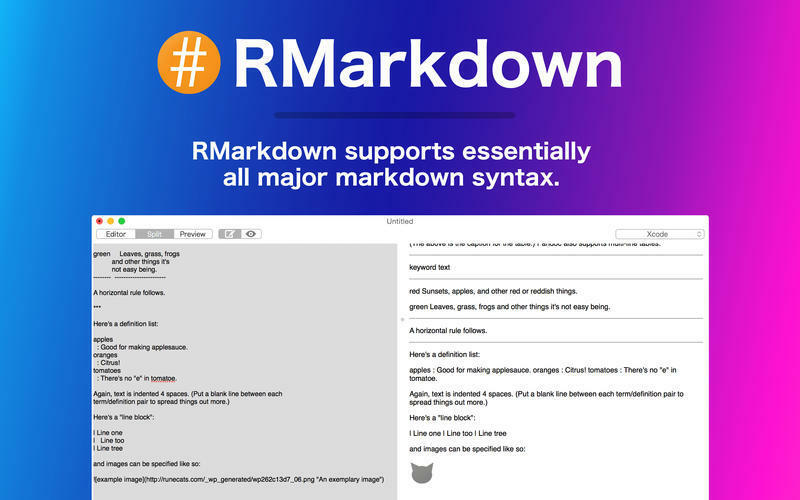 Is RMarkdown really the best app in Developer Tools category? 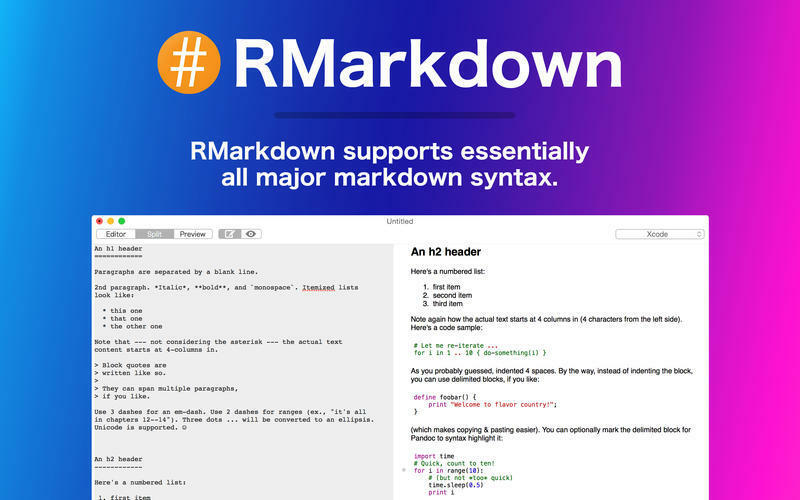 Will RMarkdown work good on macOS 10.13.4? RMarkdown is a minimalist and distraction free markdown writer and editor, it comes with three view options, the editor mode and the preview mode, or alternatively you can have the split mode which shows both. The split view gives a live preview so you can see your markdown as you're writing it. RMarkdown needs a review. Be the first to review this app and get the discussion started! RMarkdown needs a rating. Be the first to rate this app and get the discussion started! RMarkdown even gives a live preview of rendered Markdown for files which have been edited externally on save! RMarkdown comes with many pre-installed styles for your markdown, including Github, XCode, Plain, Sans-Serif, Night and Google Code. RMarkdown essentially supports all markdown syntax and can display it beautifully with the built in styles, we plan to keep adding new styles in the future! 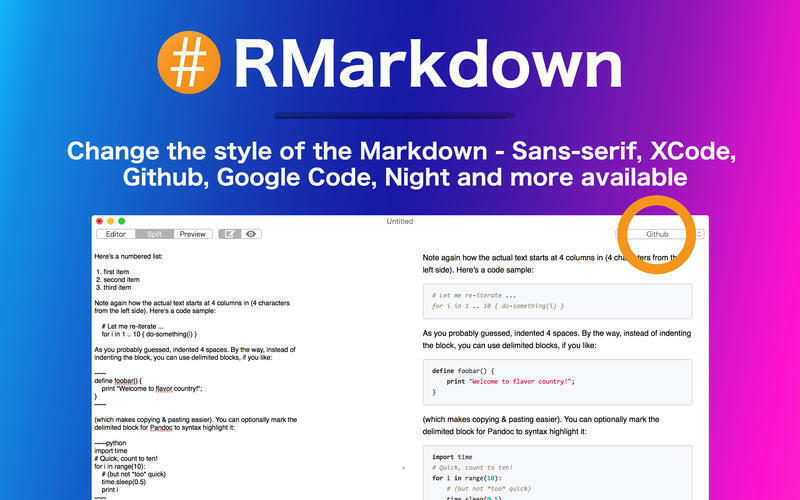 RMarkdown was dreamt up after the work we did on the RCode project and the Roccat Reader Project, RMarkdown combines the style of the two successful projects. We hope you love the simplicity of RMarkdown!